This nice old lady regulary served breakfast for us in her little restaurant, in the middle of the village. 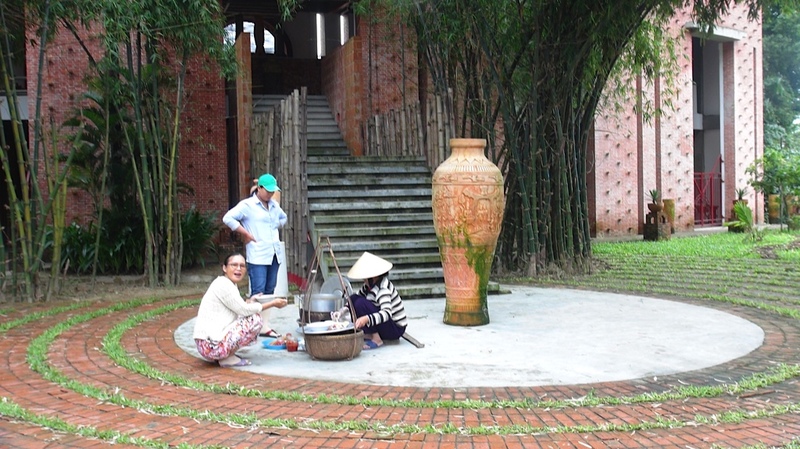 Every day a street seller brings breakfast at the doorstep of the Museum. Looks always fresh and smells and tastes deleicious. Every day! Drinking coffee at the other side of the street we had a view at this beautiful little shop. It seems like they sell evrything except kitchen sinks. Filled with everyday household things. Even a hand-pump with gasoline for the mopeds in the street. At the corner another breakfast place with one day rice pudding and the other day rice noodles. All fresh and clean. Frequently the street around it is a quagmire. Keep smiling! All the little stalls have their own customers. Real fun! In this is a coffee shop they make very delicious coffee. Vietnamese coffee with a little splash super condensed milk or black with a spoonful sugar. They make the coffee in before and safe cool. Ordering 'hot coffee' you get served your glass strong coffee 'au bain marie'. And always a glass green tea included. With the green tea you wash down all the coffee and you are ready for the next nip. You have to get used to it and then it's a delicious combination. This is Thanh Ha too. The fishermen in the village put the mend nets at their doorsteps. It looks beautiful. It's just like a moved picture of water streaming out of the houses. Also one picture some closer. This was een complete surprise for us. 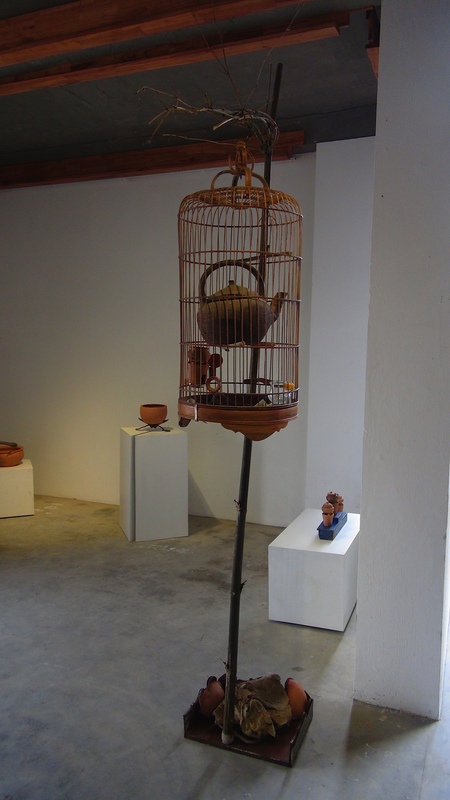 Nguyen, the director of the Terracotta Museum, asked a big picture of the birdcage with teapot. 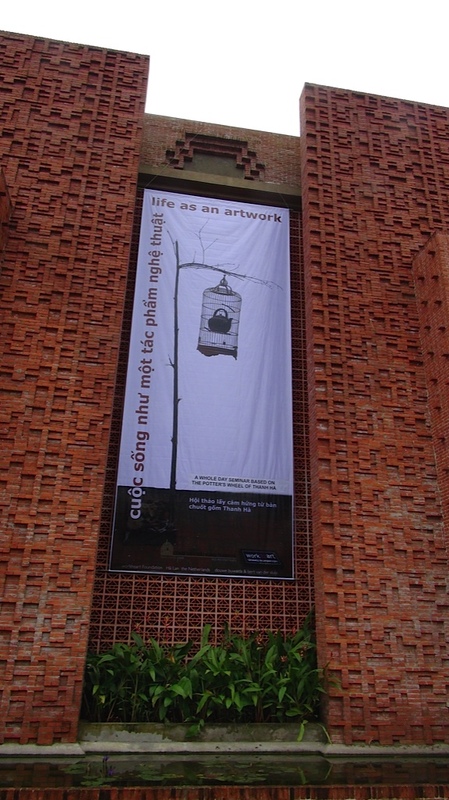 He came back with this poster, 7 meters high, of the exhibition "life as an artwork". It will hang here for some time. 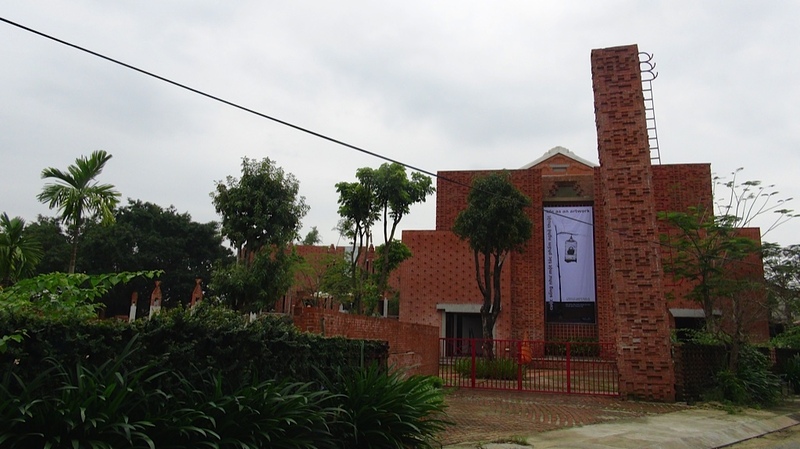 The exhibition shows work we made on the spot and also with material from the village. Everybody is pleased as Punch with all the things we did. We are also very glad. We had beautiful times in a village with people who are trying as hard as possible and in all simplicity to keep up with this time in transition. It's a visible, painful process. But preserving their dignity. We are learning everyday. And we really succeeded in making a respectful contact with them. We are coming back to develop seminars and workshops. An inspiring place. The poster at night. The streetlamp provides, via a fire escape at another building, the shadow of a ladder to the cage. At night, in the dark, the teapot can escape for a moment. Douwe was able to register with a candid camera. 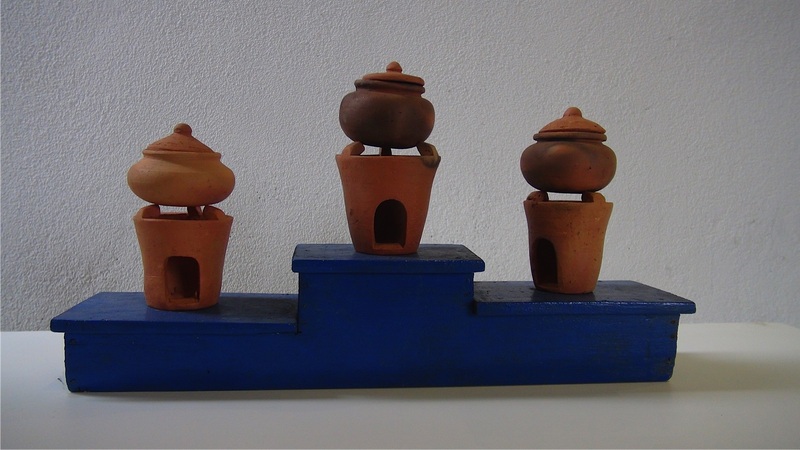 This is a kind of 'ready-made' little claypots from the village put on a little handicraft found on a dump site. Suddenly the whole is beautiful poetry. This is the teapot in his cage with a specail manger. Everybody loves this work. We also feel good about it. This is our biggest hit. It's a terracotta pot, turned for us in the village, put on a hand forged shears; we asked the smith in Hoi An to transform the handles. The pair of shears is changed in the stand of the pot. Still wet, we put the pot on the shears. After firing fortunately he still fits at the shears. 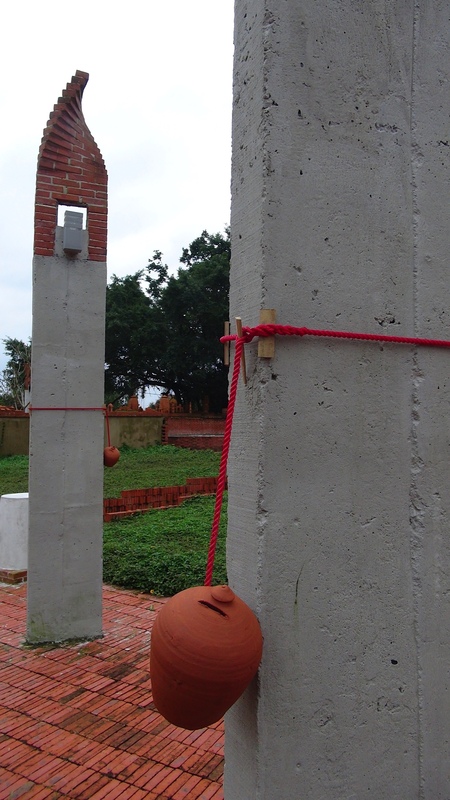 The cleft soccle was a present organizing the exhibition. The whole became a very exciting work. 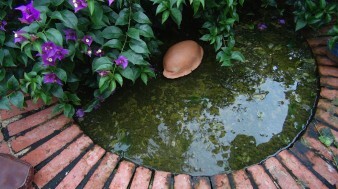 This is also a beautiful interfering in the pot while he's still wet. 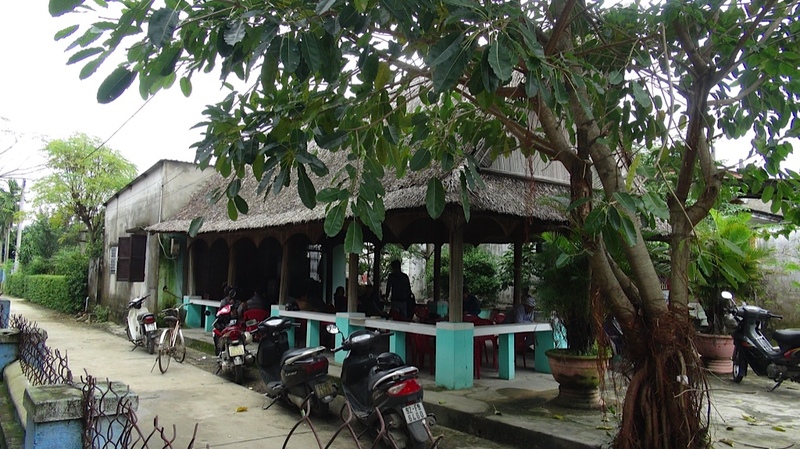 Another one special turned for us in Thanh Hà. We put the little hoe – for tilling the soil- in the rim. The work is calling: Cut-1. Who does what? What happens if you don't understand? People see all this kind of interfering as very exciting and they appreciate it very much. And that's great for us. 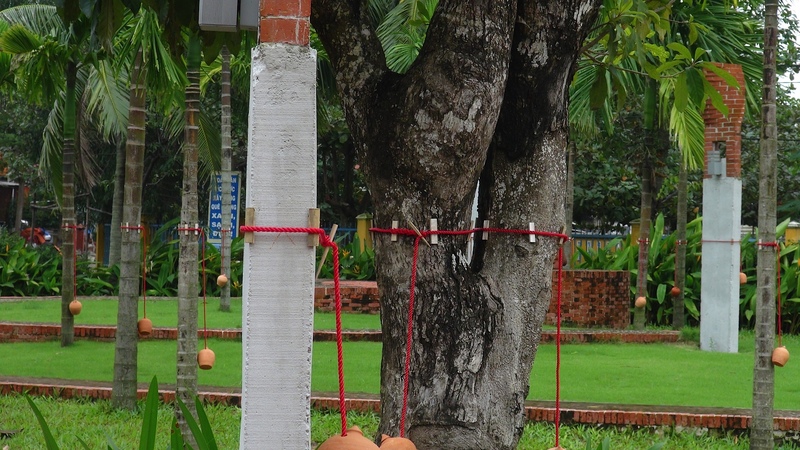 As a result of a story about the regulary high water level in Thanh Hà and Hoi An, we build up an installation In the garden of the museum what indicates the high water levels of the last two years. 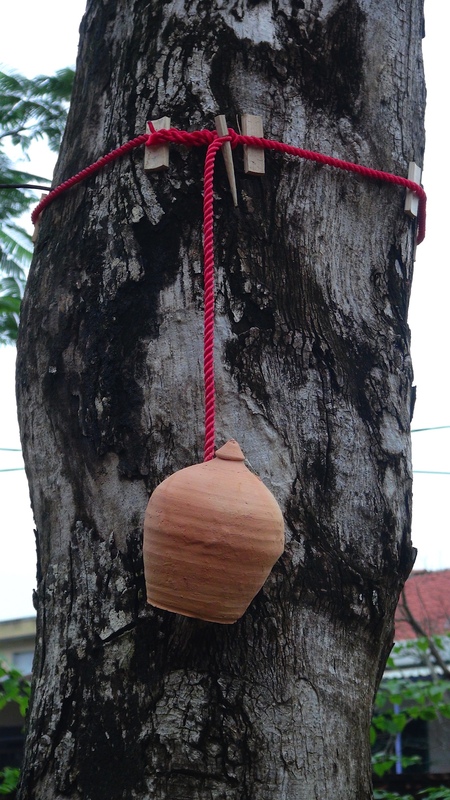 On that high water level we hung moneyboxes, made in the village for tourists industry. 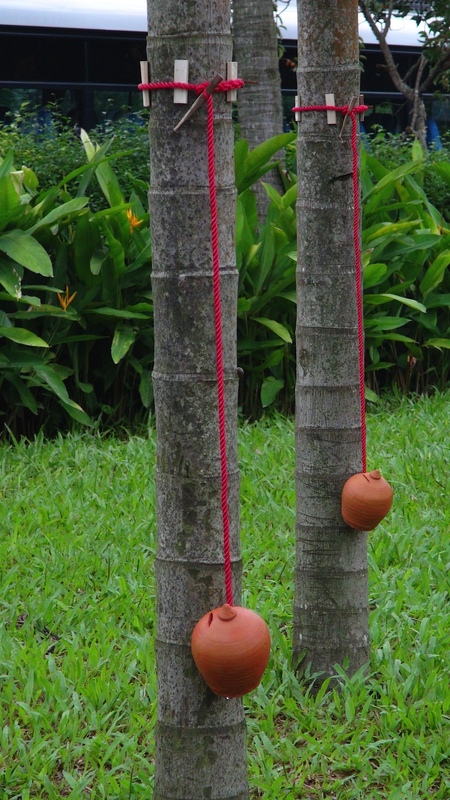 There are 43 trees and objects in the garden, with 43 moneyboxes averting at 43 markings the water level. 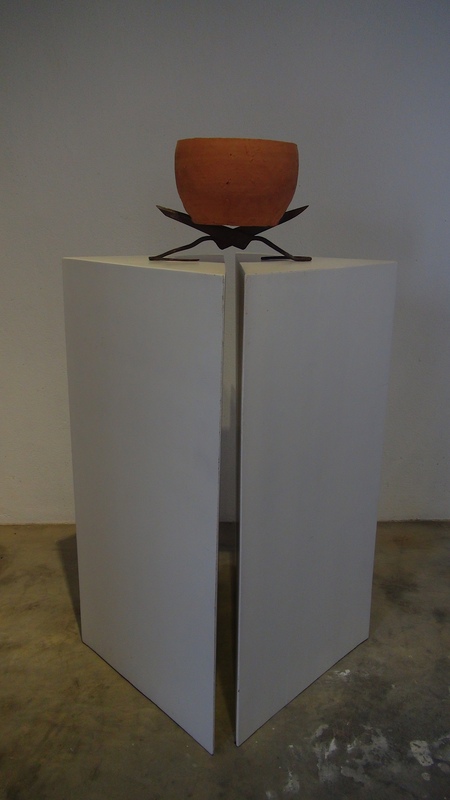 It wasn't easy, but in the early part of the third week we agreed at this sculpture. It shows the recurring flooding about 1,8 meters above the ground level. And then it's the 21th of December – we realized the workshop "life as an artwork". We worked three weeks; the autonomous work, the installation and the seminar! 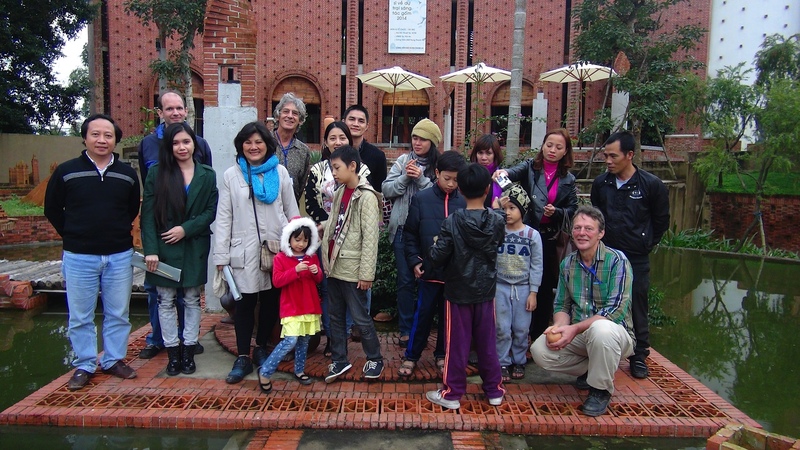 After an introduction in the Terracotta Museum the participants visited the potters in the village Thanh Hà. 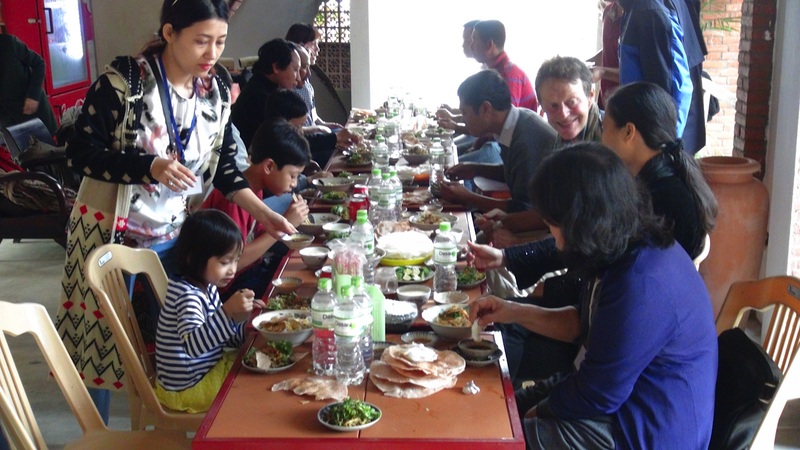 After the visit at the pottery village the group returns for lunch in the museum. An exchange of gained impressions. They are working on a 'clay-task' now. What's happening inside counts, not the visible results. A little bit insecure, but very enthousiastic, the participants dive into working with clay. After 10 minutes they pass on their work on the neighbour. And again and again. All impressions are registered on photo and discussed afterwards. 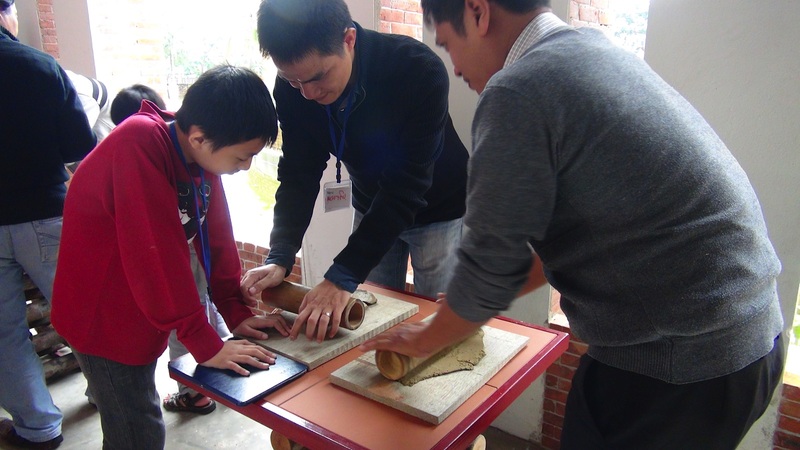 A participant child shows pridefully his work. A prospective artist. In a group discussion Douwe guides with apt questions the communication about their experiences. 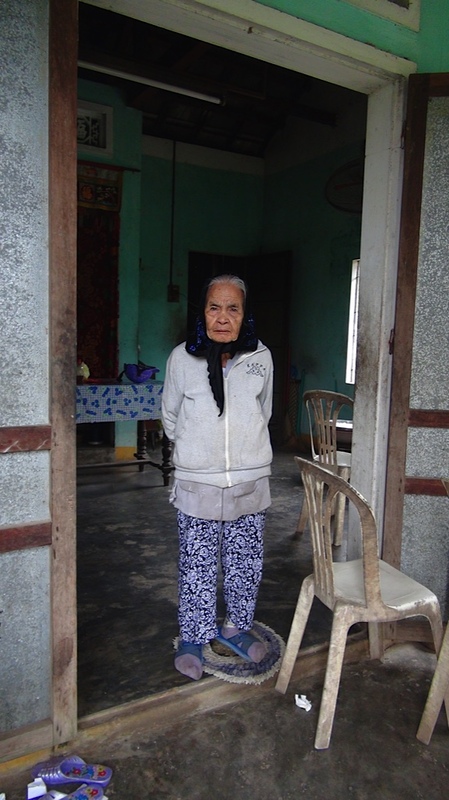 It was quit a job to get real contact with this group via an English – Vietnamese interpreter. Although it was a beautiful experience. 'Your life an artwork' it's most rewarding. 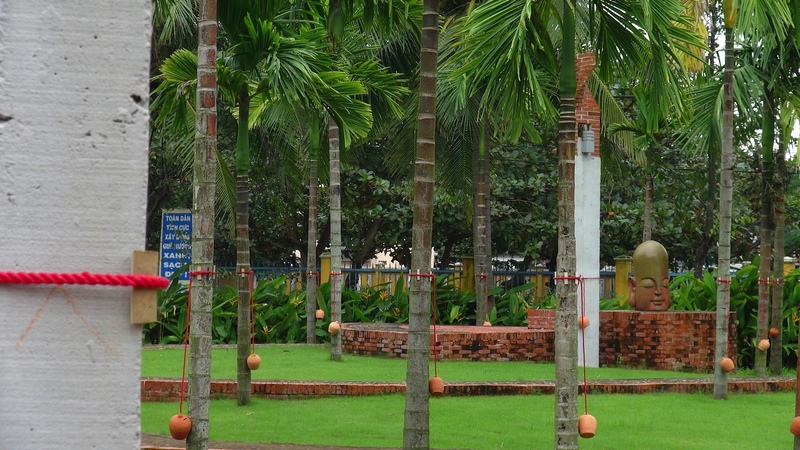 Also in Vietnam. People are human beings everywhere. 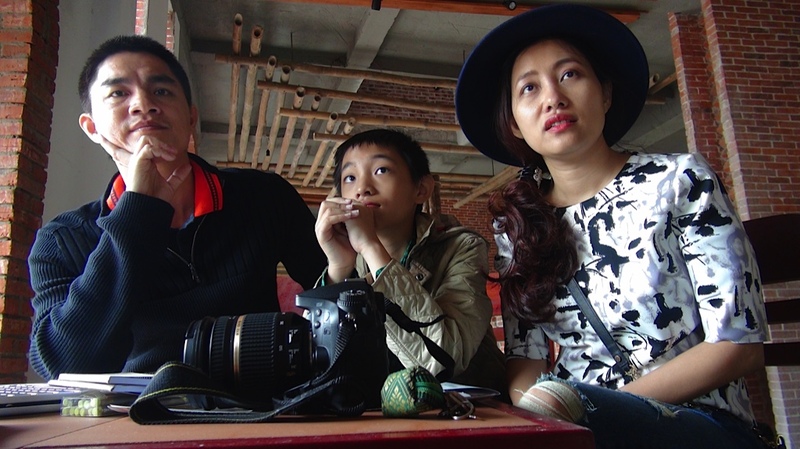 Here Mr. and Mrs. Van Nguyen and son Khôi. The museum director and his family. 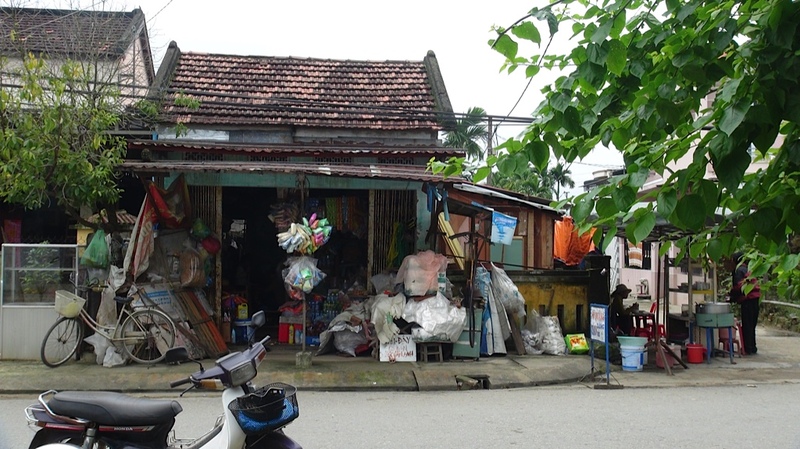 He comes from Thanh Hà, she is from Saigon. 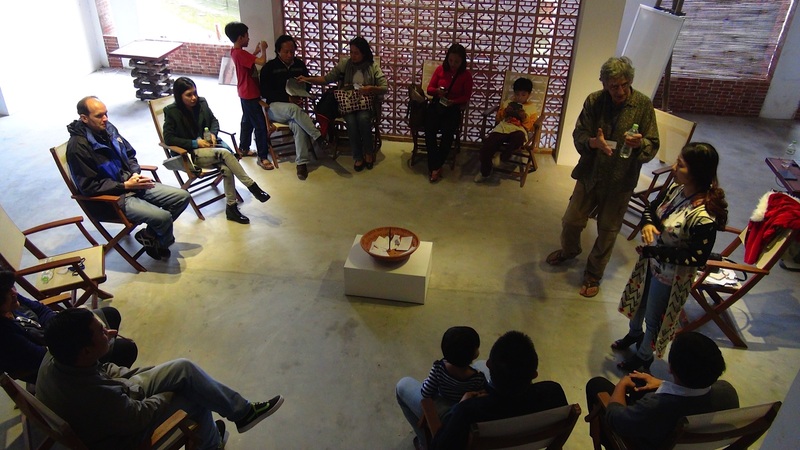 During the workshop she and her son were interpreters for the audience. 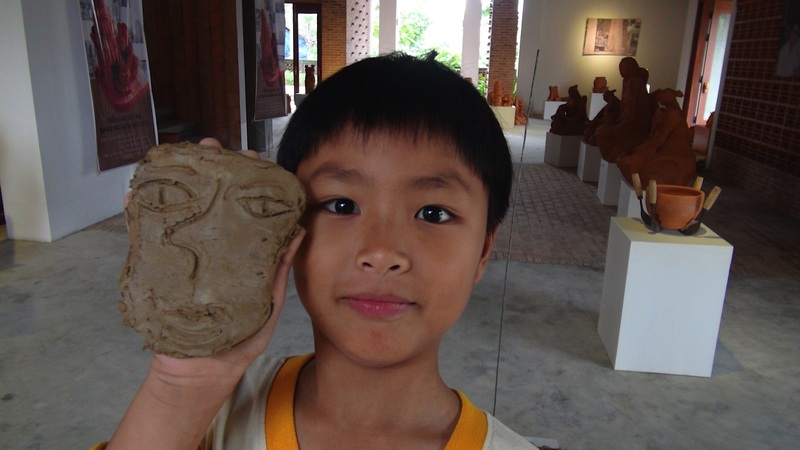 Khôi goes to an international school, he is aged 10 jaar and he speaks English fluently. After the workshop we left again, symbolic, a seed we made on the spot at a central site in the museum garden. 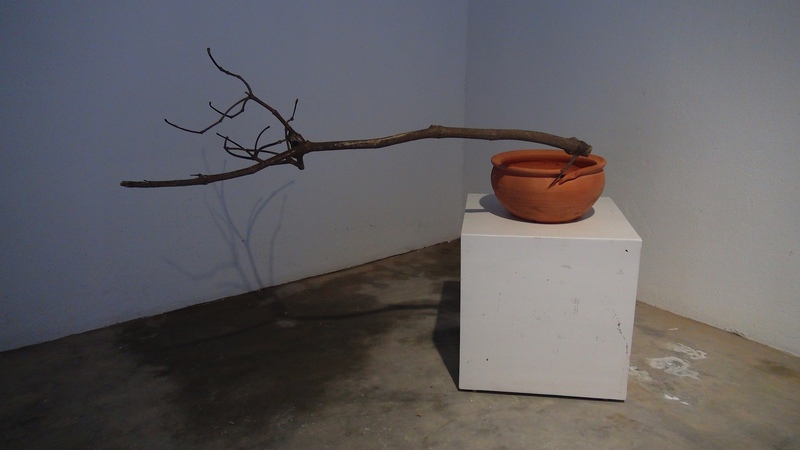 Nguyen choose that place to get the biggest symbolic effect. 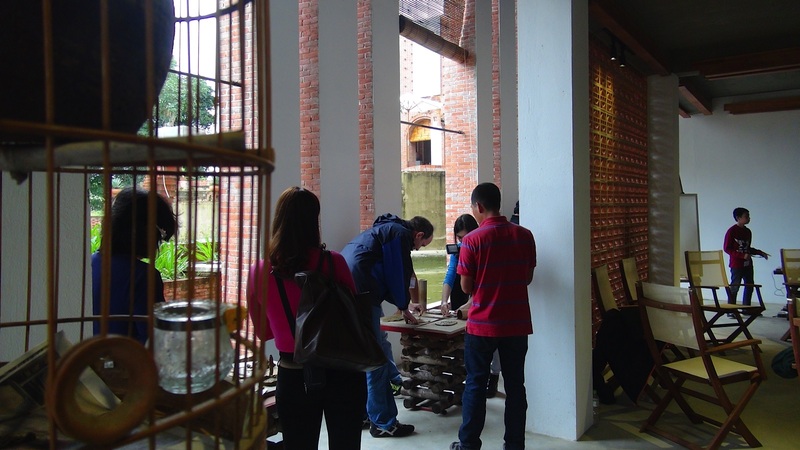 The group participants is saying goodbye at the 'art-seed' site. Is to be continued. Perhaps we are coming back next year to develop more seminars. We'll keep in contact.